Good classroom environments. More than just a room full of Ikea furniture. Simon Brooks. Colin Klupiec: Environments, the surrounding conditions or influences in which a person operates. Although most educators inherit a physical environment fashioned for an old paradigm of learning, there is still much that can be done in the design of that space to facilitate and promote a culture of thinking. Simon, are we talking about feng shui? Simon Brooks: I think we're talking about the physical environment being the body language of an organization. That's I think a really good way of thinking about environment. If we think about body language being with people as being a very palpable way that they send messages about what they are valuing, so too does the physical environment of an organization. Question such as, does this organization value thinking or does it inhibit thinking are answered, I think, through the physical environment of an organization. So if I'm going to answer your question, if we think about what feng shui is, I think feng shui's all about organizing space in relation to the flow of energy. So if that is what things feng shui is about, then well yes I think that is part of the big consideration of the cultural force of the physical environment. You know, how might the physical environment be an energy booster and a thinking primer for the learners that exists within it. Colin: The body language of a physical space, now that's a very powerful concept, I quite like that. And look, this really is quite a serious consideration, I don't mean to make light of this in any way at all. However, there is a lot of controversy around environments and spaces particularly given that that's something that you can very easily spend a lot of money on. Is that there's a quote in the chapter that goes like this, saying that factories are about efficiency conformity and control. Hence we have classrooms of the same size set up in largely the same way, when the bell rings, students flow out of their classroom into the corridor so as to provoke progress to their next stop along the line. This design feature of schools has been referred to as "cells and bells" equating classrooms not only with factories but also with prisons. Is it really that bad? Simon: Well first of all I'm enjoying the assonance of "cells and bells" and that is what that phrase suggests isn't it, that not only factories but prisons? If we think about what a cell does. Well a cell is the same for every individual person that might reside within each different cell, it's a similar experience and then the bells also facilitate smooth movement and transition from one place to another, perhaps sending a message that the inmates themselves can't be trusted to self organize in that respect. It definitely makes control and supervision much easier. I think "cells and bells" are in the gene pool and we've used that phrase before, a phrase that comes from Ken Robinson, within the gene pool of education, and I would say that probably the vast majority of schools in the world are still set up with that "cells and bells" paradigm as the dominant one. Colin: It's interesting actually, just this morning as I was thinking about our interview which was going to happen later today, I went for a cycle very early in the morning and that's when things are still very dark and on my regular ride, I go past a primary school and the lights on the inside of the building happened to be on and I got a very good glimpse into the building because it was dark outside and light inside. And it was an old Australian design and it gave me that, you know, remember the days of the old schoolyard kind of feel. And as I went past I thought, "Oh, there's a corridor and there's a door, and then there's another door, and then there's another door," and it really did have that kind of cells sort of feeling. And I thought what if it really is that bad and what if there are lots and lots of buildings that are still really around there like that? What are the negative effects on thinking in an environment like this? Simon: The first thing I'd like to say in consequence to that question, and this is interesting, is that I think there're a lot of adults that think back to their learning experience in cells not that long ago when they were students and have some really rich and amazing memories of their time learning in spaces like that. And I think that's important to acknowledge. And I will...I'm not sidestepping your question, I'll answer it in a second, but I think it is what happens within a space that is the most important factor. And we can create a large open plan learning space with soft furnishings and access to online resources so that learning is self-directed. You know, we can do all of that, but if that means abandoning the rich person to person interactions that we talked about in the previous podcasts in this series which are so crucial to building a culture of thinking, that I'm not sure that the payoff is worth the loss. But I will answer your question about the potential negative effects in an environment like this. Well, if cells send a message that learning is about receiving information and then if that's what happens inside that space, then obviously that's tremendously damaging to building a culture of thinking. And bells, well if bells send the message that learning can be broken up into separate discrete experiences, that I'm going to learn my maths. And then the bell will ring and I'll stop learning maths and then I'm going to begin learning English, then maybe the message is sent that learning is discrete and not connected. And we know that in a culture of thinking, we're looking to try to build as many connections both within and between disciplines as we can. Maybe "cells and bells" as part of the cultural force of environment are counter effective in terms of building a culture of thinking. Colin: Just like to come back to the comment that you made there on adults remembering back to their time in what they would call a cell. As you were saying that, I recalled a time when I was in class and in fact I was in my maths class. Simon: I think it probably polarizes peoples, you know, very easily it can become something that one person loves and another person hates. Colin: I'm going to get a whole bunch of statisticians on the podcast and we're going to sort that one out once and for all. But the thing I'd like to recall is that that was a class, that was my HSC or my, you know, year 11 year 12, my final 2 years of school maths class, and I think that the interactions that I had with my teacher were some of the best that I'd had with any other teacher. You know, you remember back to those really influential teachers in your life that made a difference. And I remember that maths class being incredibly rich in its thinking and in its pushing of students to achieve a better understanding, higher results, all of those things. But, you know, I can even remember where that was and coming back to "cells and bells" would you believe it was actually in what was called D-block? In other words, boy doesn't that sound like, you know, a cell reference in a prison somewhere, D-block? Colin: Don't go into D-block unless you've got an entourage of protection. But the thing is, when I think about the room that was my maths classroom, it was very plain. There was nothing on the wall. There were just individual desks and chairs that were all facing in the same direction, but it didn't bother me. For some reason we all did really well and it must have had something to do with that incredibly good quality connection and set of interactions that we had with our maths teacher. So I think you're right, we have to be careful that we don't go too far one way or the other in thinking about environments like this. However, I would also say that some of those rooms are pretty darn awful and maybe teachers don't like that either. Why aren't we more vocal about it? Simon: Yeah. I think it's interesting, why aren't we more vocal about it, perhaps it speaks to the fact that some teachers really do like being in those type of spaces. You know, those spaces work for them. And is that always a bad thing? If all those other cultural forces are at play, then maybe that's fine. But I guess what we need to think about is, "Okay, have those teachers seen a different way of doing things? Have they seen the value and the benefits that might come from alternative arrangements of the physical environment and might that then help them in conjunction with those other cultural forces make it an even richer place to be in if they pay attention to some of those ideas?" Colin: So environment affects both culture and thinking and we alluded to this earlier, what do our spaces say about our culture? Simon: I think spaces create culture. And we know that the environment is one of those cultural forces and the interesting thing about each of the cultural forces is that they in the way that we leverage them, shape culture. So to answer question, I think space can say everything about culture. The way the room looks and is set up is an expression of how a teacher is and how learners are in that place. Colin: Let's be completely utopian for minute and let's refer to a design theory that states form follows function and this is referenced in the chapter on environments in Ron Ritchhart's book. Let's be utopian and ask what does a space that fosters a culture of thinking look like? Colin: Oh crikey, you're going to have to explain that. Simon: Oh they're fascinating and they were first identified in an SF called "Campfires in Cyberspace" which is an intriguing title back in 2004, and then more recently in a book. There are a number of what Thornburg identifies as these primordial learning metaphors. But the first three of these particularly are taken up by a lot of schools who are interested in building utopian learning spaces such as the ones that you're asking me about. And the three I think that are particularly interesting are the metaphors of the campfire, the watering hole and the caves. Campfire, well the idea behind that is that a campfire is when we come together to listen to an elder of the group and be inspired, that's what happens around campfires. How can we make that happen in schools? Teachers who are of the traditional stand and deliver, you know, chalk and talk mindset, quite often they would view every lesson that they do as being a campfire. You know, to listen to the elder and be inspired. But I guess the question first to ask is, are we inspired? There's something lovely about that idea of a campfire, the faces of the people around the campfire lit by the flickering light and the flame that suggests that a true campfire experience is not just being the passive recipient of boring stuff, but being inspired by the stories that are told. The campfire, how can we build learning spaces with opportunities for campfire experiences in mind? And the second one was the watering hole. If we think about what a watering hole is for animals, then that might help us understand what it looks like for learners. It's when in small groups, we bunch together and learn from each other in a conversational and nonhierarchical way. How can we build environments that facilitate watering holes taking place as well as campfires? And then finally, the cave. We all need those moments when we're going to retreat from the group to engage in a bit of individual thinking and reflection. I think a utopian learning space would be one that is designed with those type of opportunities in mind or at least it has the flexibility for those three thinking opportunities to take place, the campfire, the watering hole, the cave. Colin: The thing I like about that is that you haven't told me to paint a wall a particular color or organize a particular arrangement of furniture or shop at a particular place to go and get the right furniture, you've actually got me thinking about my space or any person's space and what they can deal with because I guess this is one of those things that you definitely cannot rubber stamp. Simon: Yeah, completely. And this can be done in an expensive or an utterly inexpensive way. We can redesign a whole school based around principles like this, or if there's no money at all, we can just think about how can we make this happen in different ways in our classroom so that the form of the layout of our classroom follows the function, aligns with our core pedagogical identity. Colin: I must say I have actually seen one learning space that was built like this and I couldn't help thinking that an apt title for the room would be the IKEA Room because it looked like someone had an empty shell of a building and thought, "All right, here's the IKEA catalog, I'll have one of everything, thanks." It just got me thinking, was this really thought through or does some colorful furniture really make that much of a difference? Have you seen a couple of spaces that appear to be working? Simon: I think there are lots of teachers around the world and many schools exploring ways of creating spaces that look a bit like this. One at school that some of your listeners if they are in Australia where we're conducting this interview might want to visit is the Sydney Center for Innovation in Learning, and that's at Northern Beaches Christian Schoolhere in the north of Sydney. Those folks are really playing around wholesale with these type of ideas and how can they create inspirational learning spaces built with those type of primordial metaphors in mind. So it's possible to do that on a wholesale basis. But then I know that there are so many teachers around the world who are just doing this for minimal cost within the context of their classrooms. And some classrooms are really small. But still they can they can provide those type of opportunities. For instance, if we arrange our classroom in something of a horseshoe shape, then we're immediately in campfire format, but it's really easy for that then to become watering holes if children collect around either end of the horseshoe or in the middle part, and then it's really easy to push some desks around and also very easily create some cave space. And the learning that happens in a low-cost classroom like that but which is driven by the type of pedagogy attached to those primordial learning metaphors, could very well be much more powerful than in a whole school where the whole school is built around those principles with the IKEA furnishings that you were talking about. That’s because here's the thing, it's what happens in those spaces that matters and if the pedagogy is aligned with how the space is set up. Colin: You've mentioned cost there, so let's focus on that a little bit. Whilst teachers might not be able to redesign their whole school, they might have some influence on their own classrooms, if not complete influence. Ritchhart mentions four fronts to consider when thinking about our environments. Let's see if we can draw some practical things out of this. He talks about visibility, flexibility, comfort and invitational quality. Let's talk about a couple of those starting with visibility. What's he talking about there? 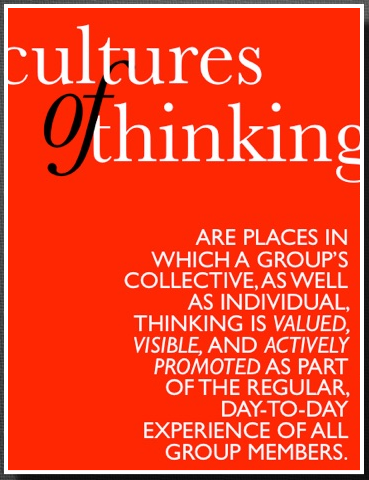 Simon: When we think about a culture of thinking, we think how crucial it is to make thinking visible. And that can happen just in conversations when we say things like, "What makes you say that," and then a chart justifies their thinking. But sometimes it can actually be that physically it's made visible. And great classrooms are places I believe where thinking and learning is constantly up on the walls for a while then down again, then up again. The walls send a message. In other words, thinking in progress. That's what matters. Teachers leverage these type of ideas in different ways. Quite often I think that when you go into many secondary school classrooms, they can sometimes be deeply, deeply depressing places to be. And that's not necessarily a criticism of secondary school teachers because often they are quite itinerant creatures who don't necessarily have the same space that they're in all the time. For that reason, primary school classrooms tend to be much richer places. There's often a lot more happening in terms of the way that the physical environment is laid out. But I remember a really interesting interaction I had with a primary school teacher I worked with in the past. She was a wonderful, wonderful teacher, and for the purposes of this anecdote I'm going to call her Sally, so as not to directly identify her. And Sally was a wonderful primary school teacher, and she came to me and she said this, she said, "I know that my classroom is a beautiful place. There is evidence of students' work all around the walls. Much of it is laminated, much of it is covered in glitter. It's beautiful in here. “But," she said, "I have a worry, and my worry is that the way that this classroom is set up and the work that I've got on the walls is communicating a message to my learners that it's only polished work, finished pieces that matter in this place. How can I turn my classroom into a physical environment that sends the message that it's work in progress that matters?" So with some support from me, this is what she set her mind to and the classroom became messier but more thoughtful. Stuff would go up and come down, routines like three to one bridge were being employed to surface children's initial thinking. That my stay up for about three weeks, then children would pull it back down again, finish the second part of the routine, three to one bridge, to indicate how their thinking is changed and they could be heard to say things like, "Wow, I can't believe I used to think that before we plunged into this unit," or "Look at what my questions used to be, my questions now are so different." Once we start trying to find ways to make thinking visible, that's a powerful way to leverage our environment to build a culture of thinking. Colin: Does that relate to the other front of flexibility being able to put things up and then tear them back down again and not being too locked in? Simon: Well yes, why not, Bob? And then one day Bob came to me and Bob said, "Okay Simon, you've been on at me for all of these years about building a culture of thinking. So I've decided, I'm going to change the layout of my classroom and it's because you've been on at me so long to do it and I'm going to change it from being in rows to cabaret style." And I thought to myself, "What's cabaret style?" I really didn't know what cabaret style would be. But he said, "I want to create clusters. You've been telling me to do this, so I'm going to create clusters of learners and take them out of rows." So I said, "Right, well I don't remember telling you do that, Bob, but that's fine. Off you go, you go and do that anyway." A couple of weeks later, Bob came back to me and said, "Simon, I knew this would happen. It's been an unmitigated disaster." And I thought, "Well that's quite interesting." I think that Bob always knew that it would be an unmitigated disaster and probably sort of proved himself right. And I think the reason why it was an unmitigated disaster because I went and had a look at Bob's class and saw what had happened. I think the reason for that is that although Bob changed the physical layout to cabaret style, Bob was still doing what he always did at the first place, which is standing up at the front and lecturing at the children. But now they were arranged in such a way that they could look each other in the eyes and laugh and joke and the behavioral side of things had changed. I think what Bob realized through that experience was that we can change the physical layout of our classrooms, but we also need to think about what happens in the classrooms, that the layout must follow the learning opportunities they create. So now Bob's playing with the idea of developing much more flexible learning spaces where we might be in campfire one moment and then watering hole the next, then cave the next. And that the room is changed to fit the type of learning that needs to happen in it. Colin: I suspect that when we talk about comfort, we're talking about more than bean bags and lounges. Simon: I think so. I mean, comfort is an interesting one. Colin: Although what's not to like about a bean bag, right? Simon: Well that's true. But we want children to be comfortable. Comfort is a power. Physical comfort is a part of the learning space. With this one I sometimes think yeah, we want them to be physically comfortable, but we want to be intellectually disrupted. So how can we find ways to use the physical environment to do some intellectual disruption? Colin: Okay, that sounds a little bit abstract. What's he talking about there? Simon: Yeah, I think classrooms need to be functional, they need to work for the learning that happens in them. And they need to be inviting to those that enter it. I've got the book open in front of me and on page 257, I've underlined a great quotation actually in terms of invitational quality. And that quotation from Ron is, Ron asks us to think about this question, "What is it in this room that makes me smile, takes me by surprise or causes me to gasp in amazement?" I wonder whether we could build our classrooms and think about curating our classrooms with that type of question in mind so that students are engaged by the experience of entering a classroom. One way that I've seen this happen in a really powerful way is when teachers create posters often just with really big questions that are intellectually disrupting as I was talking about before. You know, you might enter a history classroom and it's a huge poster on the wall. And the poster says, "What's the story and what's the other story?" That would be a really wonderful way of leveraging the environment to show what's valued in that history classroom. In other...we're not just interested in on unearthing what happened, but we're also interested unearthing what happened to the silent masses, to the people who have been marginalized by history. I went into a maths classroom recently. And in that classroom there was a huge poster on the wall above the board that said, "What's another way of solving this?" communicating to everybody, all of the learners that enter this space, that maths in this classroom is about finding other ways of doing things, that there isn't just one way. And what about in any classroom? What about a big poster that just says, "How are you being manipulated today?" That would be a pretty interesting way of using the physical environment to get them to think about the constructiveness of the world around them. Colin: Yeah, I had an awakening on the poster issue some 10 years ago because I do most of my teaching in technology classrooms and I think they really do need a massive overhaul right across the board because historically there have been rooms where you have lots of rules and you might even see, you know, the top ten rules of the workshop or the technology room printed on wall, but I find them so negative and so controlling. And some corporations are starting to pick up on this quite a bit as well. For example, BHP has a WHS or a work health and safety message that goes by the title of Zero Harm, so they have a zero harm policy. So I thought instead of putting a sign up on the wall that said something like, "Don't run" or "Don't use this machine without eye protection," what if I put up a sign that said, "Think zero harm"? And on the day that we did that, students came in, that was the first thing that they noticed and you could tell that there was an immediate change in their demeanor. So I started using other signs. So for example, you generally don't want students consuming food in classrooms and so...particularly in workshops, and so instead of saying, "Don't eat food in here," I put up a sign which showed some food but didn't have one of those horrible red circles with a cross through it, but the text just said, "Please consume food outside." To just kind of turn the whole thing around, got them thinking, "Well why would I do that? Well okay, I'll just eat that outside and then I'll come in and do some work." Simon: Yeah, it's the phrasing that matters isn't it? And if you talk about food, it reminds me of a poster I had up my classroom, was a quotation from Edmund Burke, which was, "Reading without reflecting is like eating without digesting." Simon: And the reason I included that and other quotations along those lines in my classroom was not only to send a message about the fact that thinking is of central importance in this place, but also that quotations like that had a practical and pragmatic use. Whenever we were studying anything, I would try to connect children to some of the quotations, some of the big ideas are around the room, "What connections can we make between the idea in this poster and what we're reading about the text here?" So the way that the words are used in the physical environment becomes part of the instructional focus, becomes part of the richness, creates connection building opportunities. Let's use our environment in our classrooms to make that type of thing happen. Colin: I think it's another one of those two truths held in tension situations because there is a lot of talk about what works best in education, and thinking back to the work from our friend, John Hattie, and we know now that there's increasing evidence to suggest that it's the individual quality of the teacher in the classroom that makes the most difference. However, having said that, thinking back to what Ritchhart just said about when I go into a room, what makes it interesting to be in this room? What are the things that the reach out and appeal to me? Well, what's not to like about that as well? I mean, we're creatures within an environment so we may as well like being in the environment, wouldn't you say? Simon: Yeah, I think what's important here is to think about obviously the quality of the teacher and the richness of the learning opportunities they provide is the most important thing. We could view the environment as being separate to that. We could, to use John Hattie's language, say that thinking about the environment is a distraction, that it's not what the most important thing is because the most important thing is helping teachers become the best that they can be. Or we could reframe it, and we could help teachers to think about the environment as another cultural force that they leverage. It's another thing that they can think about to help them become the best teacher that they can be. So then it doesn't become a distraction, it becomes another cultural force in the forces toolbox, another thing to think about to help them build a culture of thinking in the schools and classrooms. Colin: Simon, it's been great to speak with you, thanks so much for your time. Educator Simon Brooks: Student or Teacher Centred Learning?